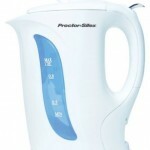 Amazon is offering the Proctor Silex 1-Liter Electric Kettle, model no. K2070Y, for $10.99 with free shipping. The Chase Sapphire℠ Preferred Card gives you two FREE FLIGHTS with the 50,000 bonus points after you spend $3,000 in the first 3 months. The points can be converted to $500 cash. Get 1 point for every dollar spent on all other purchases and No Annual Fee for your first year, a $95 value.